and a pair of tired eyes. the land is getting thirsty. parts of then tangle to the breeze. Say: the sun will burn bright. I’m not from the desert, and I think she knows it. I’m not from the southwest, and I think she knows it. I’m not staying for so long, and I think she knows it. I’m not falling in love with her, and I think she knows it. 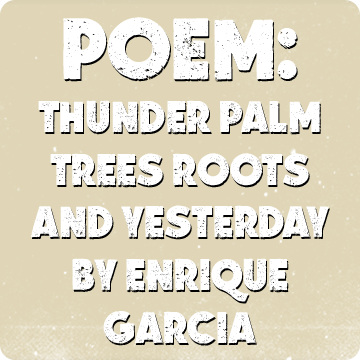 Thunder palm tree roots and yesterday. The sky is rinsing itself. The smoke of lungs released. The scars of man-kind bleed. The officer has a warrant. The immigrant hides his reality, his wife weeps. About the Poem: A poem written in the course of several weeks during coordinated Immigration officer raids in my neighborhood, I began to think about who deportations really affect. Mixing different emotions, different times and different images to obtain a central truth: it’s time we stop what is hurting our communities and our families the most, deportations. and mobilization for change. His influences are South African activist Stephen Bantu Biko, African-American poet Gil Scott-Heron, the Afrocentric MC’s of the 1990’s, Mestizo poet Octavio Paz and all the beauty of the Southwest desert holds in her hand.